In 2009, New York State's highest court ruled that since owners getting J-51 tax breaks to make improvements could not de-regulate apartments, thousands of apartments at Stuyvesant Town / Peter Cooper Village had been illegally taken out of rent stabilization. Roberts v. Tishman Speyer. But the court left it up to the owners and tenants (members of the Real Rent Reform Campaign) to come up with what the rents should actually be - while the development was being gentrified. The tenants and owners have now come to a settlement - as a result of which, the owners have put up $68.7 million to compensate 21,250 current and past tenants. When a former New York State Supreme Court judge gets so riled up that she drops the F-word, it’s time to sit down, spit out the gum and take heed. That’s just what happened when the Honorable Karen Smith (of the Real Rent Reform campaign) discussed the state of affordable housing at a November 15 community forum hosted by the Chelsea Reform Democratic Club (CRDC). After a numbing presidential election and an uninvited guest named Sandy who overstayed her welcome, Smith’s presentation was a wake-up call to a local problem in need of serious attention. She was joined by Matt Klein of the West Side Neighborhood Alliance, who provided insights regarding the planning, building and term limits of affordable housing. 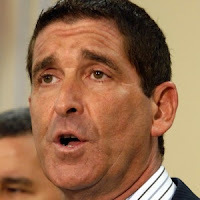 Because of redistricting, the tenants at Janel Towers have a new state Senator, Jeff Klein. We were ecstatic when we learned the day after the Nov. 6 election that the Democrats were on the verge of reclaiming the majority in the state Senate. For the last two decades the state Senate Republicans have done the bidding of the New York City real estate lobby, forcing through amendments that have drastically weakened the rent stabilization laws. 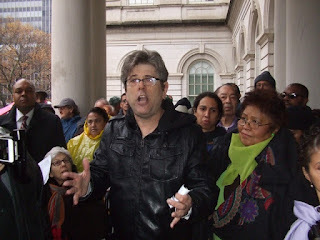 Some tenant advocates braved the rainstorm on Nov. 27, 2012 to attend the rally at City Hall to call on rogue State Senate Democrats to remain with their fellow Democrats in the interest of advancing a progressive agenda in Albany. One of the speakers was Barry Soltz of the Janel Towers Tenants Association in the Bronx, now in the State Senate District of Jeff Klein thanks to redistricting. Sponsored by:Citizen Action of New York, Communication Workers of America, Community Voices Heard Power, Democracy for America, Moveon.org, New York Communities for Change, Progressive Change Campaign Committee, the Real Rent Reform Campaign, SEIU 32BJ, Strong Economy for All, United New York, the Working Families Party . Will the J-51 bill get passed with no tenant protections? Contact Assembly Speaker Sheldon Silver: No tax breaks for owners without protection for tenants! 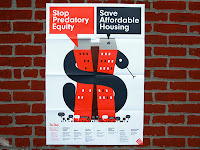 Pro-tenant state legislators and tenant advocates set out to do two things during the 2012 legislative session: to direct J-51 subsidies away from market-rate housing and toward truly affordable projects, and to use renewing the program to win pro-tenant changes to the rent-regulation laws. Election Day, New Yorkers voted for a progressive agenda in Albany. Let's stand up for a Senate that can make the change we voted for. Soul-Selling required for GOP to control State Senate? People sell their souls all the time. But in public? Meet Simcha Felder, the Brooklyn Democrat who was elected to the state Senate last Tuesday, and who, quick as a wink, decamped to Republican Majority Leader Dean Skelos’ pirate crew. It was strictly business, says Felder. The ex-city councilman — who’s lately been working for that paragon of integrity, City Comptroller John Liu — made it plain while campaigning that he’d deliver his seat to whichever team gave him the most stuff. Now, transactional politicking is what Albany does best. 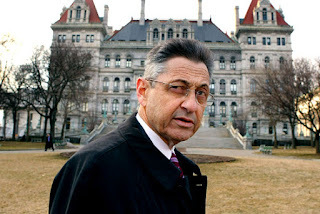 Matter of fact, it’s not the first time that Skelos has tempted feckless Democrats to his side of the aisle. And while it’s not known precisely what Felder got in exchange, his flip leaves the GOP with 31 Senate seats and Dems with 30 (with two races still to be decided) — making it possible for Skelos to retain control of his chamber. Party switch key to GOP Senate controlFelder's move leaves GOP one vote from dominating chamberBy Jimmy VielkindPublished 11:52 p.m., Tuesday, November 13, 2012 ALBANY — Republicans took a step toward maintaining control of the state Senate majority Tuesday when a Brooklyn Democrat announced he would join their conference. The announcement by Simcha Felder, an Orthodox Jew who met with Senate Majority Leader Dean Skelos, R-Long Island, earlier in the day, brings the GOP conference just one person shy of the 32 votes it needs to dominate what will be a 63-seat chamber. . . . . Negotiations to Sell Out State Senate? With paper ballots throughout Westchester and points north in New York being counted and re-counted, state legislators are wondering who will dominate the State Senate. Even if Democrats win, some are negotiating with the Republicans . . . which could be bad news for tenants. Gov. 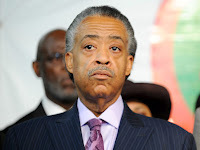 & Mayor: Help NYCHA tenants after Hurricane Sandy! The ongoing neglect of the public housing along the coastline of New York City following Hurricane Sandy is a shame on us all. Occupy Sandy is helping out. But more help is needed. 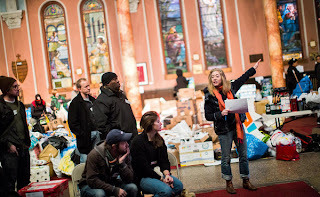 Greater NYC for Change has prepared a letter to Governor Cuomo and Mayor Bloomberg. R3 has signed on along with many other groups. Have you? Dems May Take NYS Senate! As a result of the 2012 elections, pro-tenant legislators might be taking the NYS Senate! (Almost). In the past, the Senate it has been dominated by Republicans (generally from upstate, with few tenants and little rent regulation), except for a short period when Democrats held a slim majority. (But the four"extras" decided to sell themselves to the highest bidder - the GOP. Three of the four are now in prison.) Now it looks like the Democrats have taken the Senate majority. Assuming they hold strong, we could get real rent protections. "Republicans currently hold 33 of the 62 seats in the Senate. On Tuesday, Democrats had clearly won 31 seats and Republicans 30 in a chamber that will grow to 63 seats next year because of redistricting." NY Times. get rid of tenants paying affordable rents and bring in higher-paying tenants, or stop maintaining the building.If the tenants fight back, the landlord sometimes walks away - forfeiting the mortgage, leaving the bank in charge and the tenants with nothing. Then the tenants REALLY have to fight. So watch the UHAB video for a great example. The NYS Senate has been dominated for many years by anti-tenant legislators. Help change the State Senate's point of view by working for the election of pro-tenant legislators. JOIN TENANTS PAC in a PHONEBANK for George Latimer, an Assembly Member running for the State Senate from Westchester. What: Phonebank -please bring your cell phone and a charger. You'll be calling neighbors in Westchester. Where:410 Columbus Avenue at 79th Street (a storefront) in Manhattan.